Hope everyone had a wonderful Christmas. Today I went out with Rex Gudgel. We stayed out all day fighting the very windy conditions, determined to find hungry fish. Needless to say, it was tough: high winds, bluebird skies - standard post-front conditions. 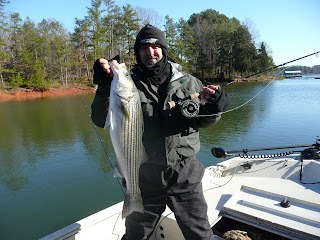 The water temp has dropped to 50 and the fish have gone north, most of which had lock-jaw today. We did make 4 fish eat: boated 2, broke one off and missed one. If you are looking for a great way to end the year, this would be a good choice. Most fish we are catching run from 9-15 lbs. Intermediate and sinking lines are the choice right now. As you can see in the pics it was freezing, my face looks like I went snow skiing for a week from wind burn. What flys were working for you? 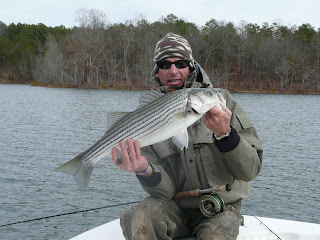 Stripers on the fly looks like a lot of fun! Mike, clousers 2-3" for shad, and whistler or large clousers 3-5" for herring patterns.